The Cats Tripe: How many beans? Some of the beans we plan to plant this year. Starting from the bottom, the striking black and white beans are called Yin Yang although I've also seen them described as Orca, like the killer whale. You can see the resemblance. These beans came via a seed swap contact and the donor was very generous and gave me two forms of this bean, the simple black/white ones here and a selection where there are spots of black on the white sections giving an even stronger impression of the Yin Yang symbol. These are dwarf beans and should not climb. The next bean clockwise is the Jersey bean, a traditional variety from the Channel Islands just a hack and a spit away from us in Normandy. Another dwarf bean, I chose this from the Heritage Seed library because of its history. I chose climbing French bean Purple Giant because I thought it might be the same as the old purple variety I was saving before everything went so horribly wrong. I've not grown them yet but looking at the seed they seem flatter than my sort so probably aren't what I'm looking for. In the twelve o'clock position we have climbing bean Coco Bicolor. Another very old variety which I've grown many times before. It's a tasty bean, easy and strong growing and the seeds are very pretty so I'm hoping to start saving this one again in my own collection. 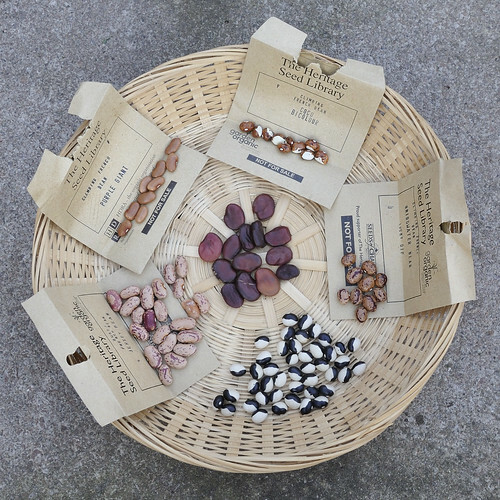 The last Heritage Seed Library variety is the Bridgwater Bean. This was a lucky dip selection so I know little about it but the beans are charming so I shall give it a go and see how it tastes. In the middle there are some seeds for Broad Bean Red Epicure. Lovely maroon purple beans that I like the flavour of very much. I'm looking forward to getting some of these into the ground this week, the French beans will need to wait until the weather is warmer. I'll also plant some of the dwarf bean Royal Red and some more Spanish white runners which were very successful last year. That's going to make quite a hill of beans!